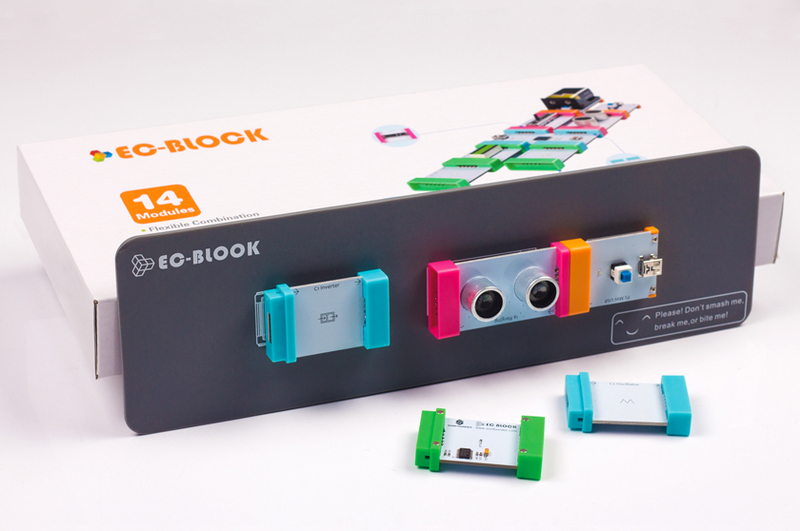 Last week we released the EC-Block Analog Kit for Arduino, an easy-to-use and powerful learning kit for not only kids and Arduino novices but also programmers, with four types of electronic "blocks": power, input, output and converter. The blocks are designed for plug and play, via pin connection; also they can be fixed on an iron surface by the magnets underneath. It's great for parents to play with your kids, or teachers with students, and cultivate their interests in physics. 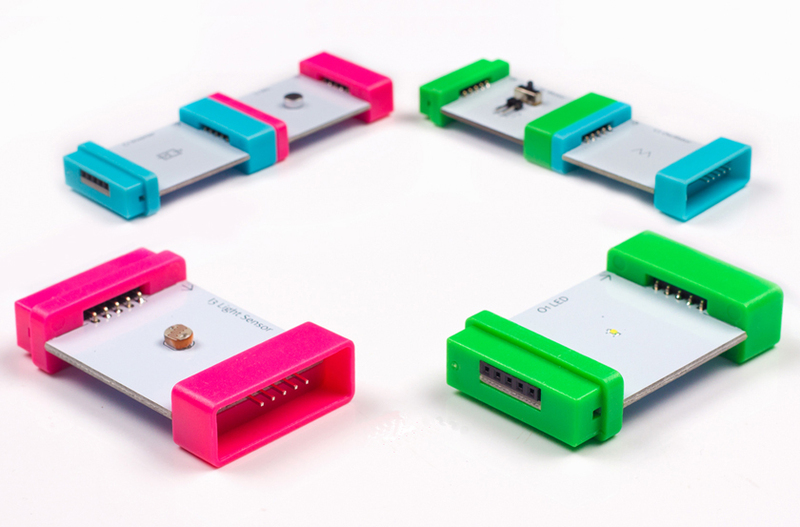 After years of serving open source electronic hobbyists, we decided to develop an easy-to-use product to lower the threshold for open source for numerous hobbyists, so you can experience the fun of open source electronics in a quicker way! 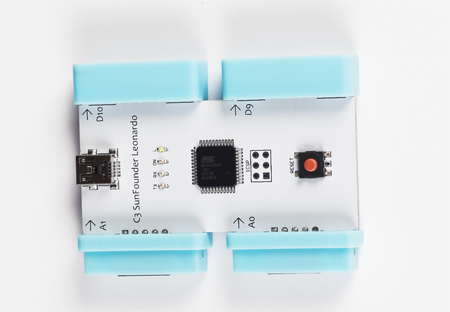 Blocks are categorized into power supplies, sensors, converters, and outputs. Each type is painted in a uniform color. 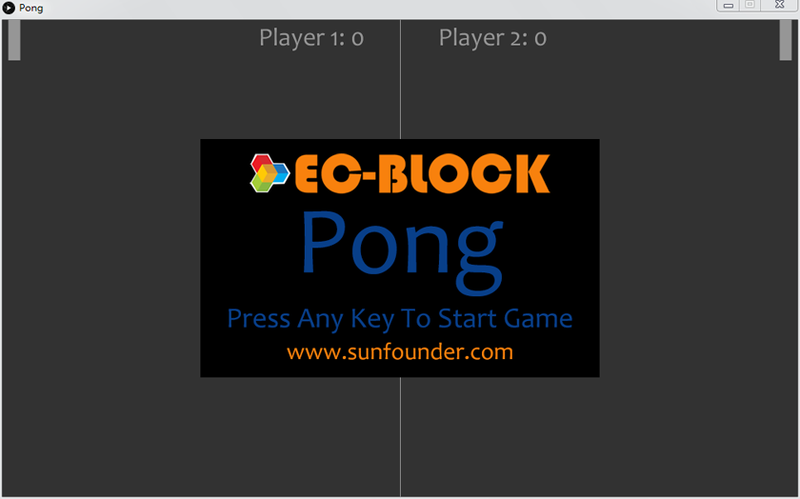 The name of a block starts with abbreviation+#, which represents their types and functions. You can quickly pick up the desired one by the label. The pin connection makes it quite convenient to build circuits. On the back of blocks we can see components scattered; the internal circuits are integrated on the board and only the needed terminals are connected to pins/holes outside the shell. 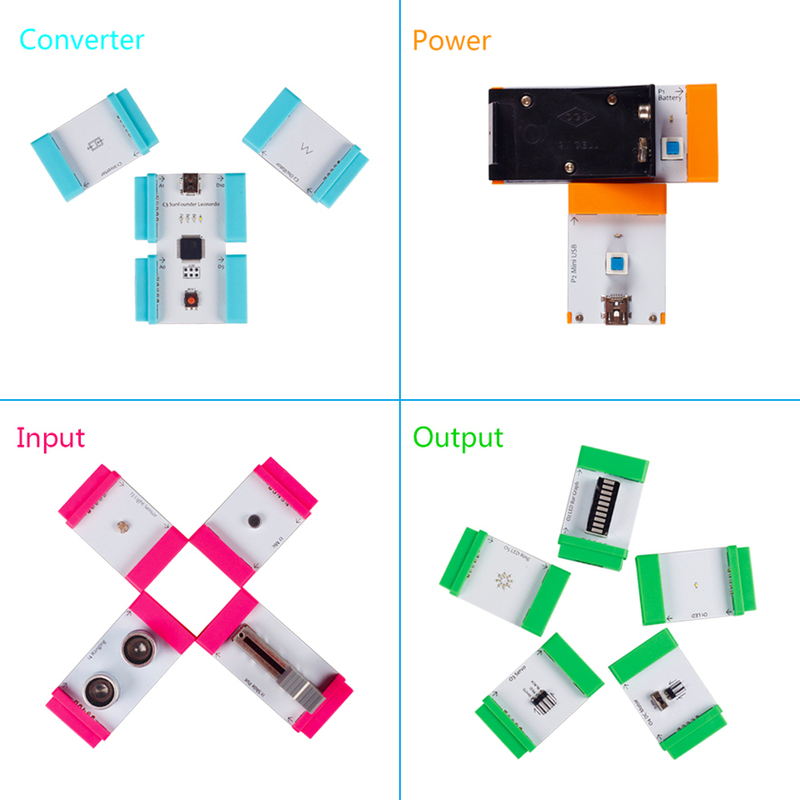 Each combinations needs a power block (either 9V battery or USB supply), at least one input and one output block. But you can also build all of them – up to you! There are far more waiting for you. Rich phenomena adds more fun when studying the physical world we're living in. 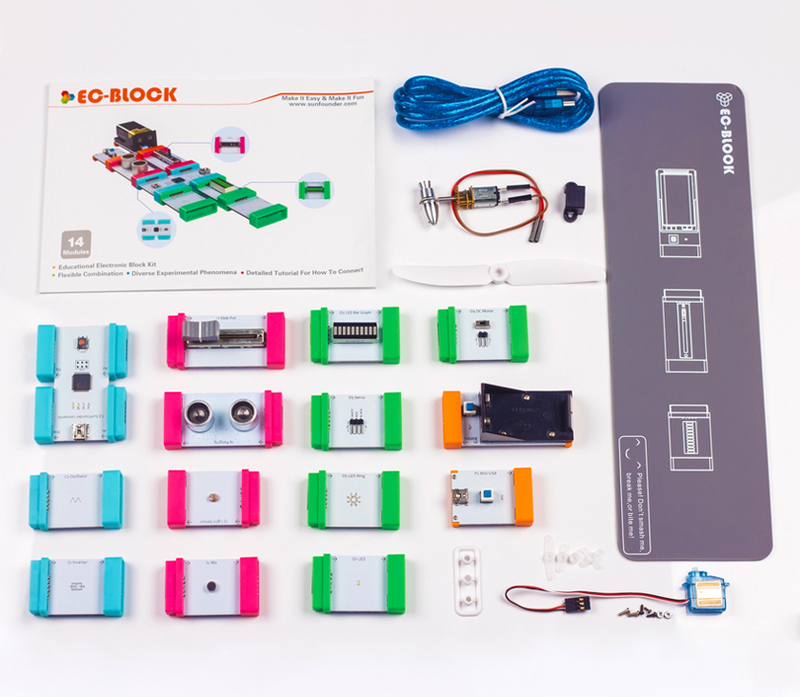 With the Leonardo block, you can upload sketches to the board to realize a variety of functions. Get your creativity go wild! Currently we have made a few example sketches for playing and learning. Highly appreciate your sharing! Apart from the easy-to-understand user manual, which provides details about each block and its application, you can also get all-around support. Thus, with a solid foundation, kids can be influenced and become enthusiastic about electronics and creating. With 4 magnets at 4 corners of the back, you can put it on any flat iron surface such as blackboard, refrigerator shell, robot back, etc. You can place a block on any such surfaces for demonstration and other purposes. Also by putting them on the iron board provided with the kit, you can take the blocks anywhere you want. All in all, this is an amazing kit you won't want to miss. Just get one for your kids and start the fun!